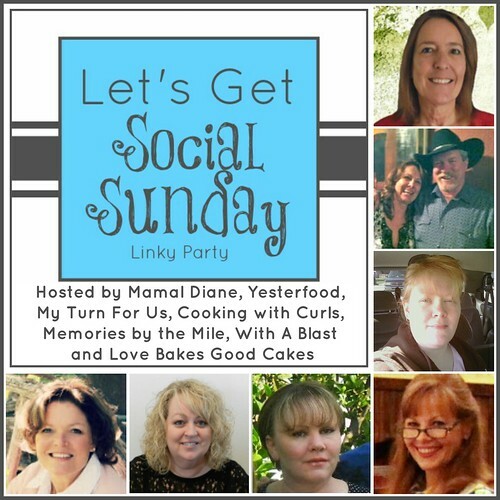 Welcome to Let's Get Social Sunday! This is a social media party- the place to link up your Blog site, Facebook, Twitter, Pinterest, Google+, Bloglovin and Instagram! Fun news! We've added the "Last But Not Least" feature! As a bonus, we'll share your blog the following week, and we'll even link-up your blog and social media for you the week that you are featured! Be sure to visit Joel's blog for a big helping of humor and good cooking! Hi Joy. Thank you being one of the hosts for this amazing party! Happy to join the party, thanks for hosting! Hi Joy! Under facebook pages I'm number 31. Can you delete me? I was apparently trying to do this too early and just entered my blog address instead (sorry). I think I'll drink some coffee and try again in an hour or two. Lol! No worries- I fixed it- I completely understand about the coffee thing! :) Thank you for coming by! Thanks so much for hosting, Joy! I hope you have a wonderful holiday weekend! Could you delete my entry under Twitter? I'm number 55 and I entered my Pinterest info. Thanks and hope you're having a great weekend. Thanks for the great Blog Hop. I love following everyone!!! Thank you for hosting this awesome hop, Joy! I'm a new follower via bloglovin and twitter! Thanks for hosting Joy, always great to meet new people. Nice to meet you! Thank you for linking up at The Great Blog Train!